I love photography. In fact, I’ve been taking pictures since I was given my first camera (an Olympus OM 1) in the sixth grade. Yes, that long. Over the years I had a succession of film cameras but made the switch to digital about ten years ago. Since then I’ve pretty much had Nikon DSLRs and, on occassion, Canon point and shoots. I’ve captures thousands of images with those cameras . . . and some of them are even pretty good. Well, a few at least. Then, the iPhone came along. It was a phone, a way to send text messages, a web browsing device and, amazingly enough, a pretty good camera. And over the years the iPhone cameras have gotten better and better. Now, they’re really good. Of course, people still use a DSLR. I do, especially when shooting Max. He moves pretty fast and the quick focus of a DSLR and Nikon lenses (especially the amazing 50mm 1.4) comes in handy. But most of the time, I find myself using the iPhone 6 to take photos. I’m not alone. People are using the iPhone a lot more every day to take photos. 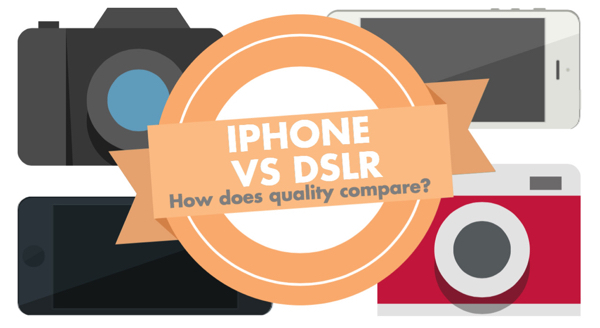 But how do the DSLR and the iPhone compare? This handy infographic (made by the fine folks at Twenty 20) answers that question and more. Check it out below. This entry was posted in Apple, Personal, Photography, Tech and tagged Apple, DSLR, Infographic, iPhone, Nikon, Olympus, Photography, Photos, Tech. Bookmark the permalink. I agree – it is getting difficult to tell. But, if it brings more people into photography it has to be a good thing.